Liftoff of Columbia on STS-80, November 19, 1996. In addition to setting a record for the longest shuttle flight to date, Astronaut Musgrave reached a few milestones for himself. His sixth shuttle flight tied him with John Young for the most space flights by any human being. In addition, at age 61, Musgrave became the oldest person ever to fly in space. 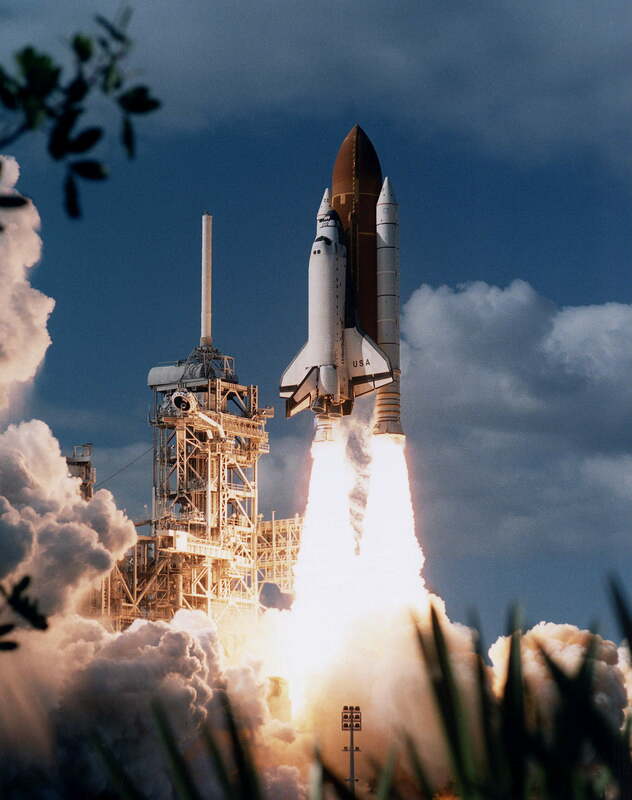 The Space Shuttle Columbia returned to space for the 21st time at 1:55 p.m. CST, November 19, 1996. Its scientific mission was to study stars, produce improved semiconductor films and practice building the International Space Station. Mission specialist Tammy Jernigan released the Orbiting Retrievable Far and Extreme Ultraviolet Spectrometer (ORFEUS) from Columbia’ s robot arm November 20, about 10:11 p.m. CST. Three hours later, ground controllers observed the telescope door opening and noted that the instrument appeared to be working properly, beginning two weeks of gathering data on the origin and makeup of stars. ORFEUS SPAS begins its free-flight after release from the arm on Flight Day 1. While Columbia led the ORFEUS­ SPAS spacecraft, the five astronauts concentrated their attention on other activities aboard the orbiter including testing the Space Vision System, conducting a visual checkout of the Wake Shield Facility (WSF) and working with middeck experiments. Other experiments conducted by the crew included VIEW-CPL, an investigation of capillary pumped loop equipment in weightlessness designed by University of Maryland students. Such technology may be used in cooling systems for future spacecraft, allowing fluids to be pumped without the use of moving parts. Astronaut Tom Jones unberthed the WSF from its latched position in the shuttle cargo bay Friday, November 22, at 2:56 p.m. Jones positioned the satellite over the left-hand edge of the cargo bay with the WSF underside facing into the direction of travel. This position allows atomic oxygen to “cleanse” the satellite’s underside in preparation for its experiment operations. The crew released the WSF at 7:38 p.m. CST. The first growth of thin films on the back side of the WSF began Saturday, November 23, at 6:37 p.m. CST. The film growths continued while the WSF flew free of the Orbiter. Commander Ken Cockrell took the shuttle to within 35 feet of the WSF Monday, November 25, and Astronaut Tom Jones latched the mechanical arm onto it about 8:01 p.m. CST. The satellite’s scientists reported they completed seven thin film growths of semiconductor materials, the maximum capability for the satellite. The WSF again was unberthed at 6:06 p.m. CST November the 27, for 3.5 hours of work with the Atomic Oxygen Processing experiment. With work to produce aluminum oxide films using the atomic oxygen available in low-Earth orbit going well, scientists were granted an extra 3 hours to finish their work and test the Orbiter Space Vision System’s ability to provide precise information on the WSF’s position in the cargo bay. Plans for a spacewalk by astronauts Tammy Jernigan and Tom Jones were abandoned after the airlock outer hatch failed to open. A post flight analysis of the hatch revealed a loose screw was the problem. Although the planned space walks were canceled, crew members took advantage of the micro­gravity environment of space to evaluate the Pistol Grip Tool in the cabin. Jernigan, Jones and Musgrave evaluated the tool while tightening and loosening a bolt on the middeck floor to evaluate the tool’s operation in weightlessness. Scientists were given an extra day of science gathering with the extension of the STS-80 mission. The ORFEUS­ SPAS satellite was captured from its orbit using the robotic arm about 2:26 a.m. CST, Wednesday December 3. Jernigan, Jones and Musgrave performed about four hours of robot arm operations with ORFEUS-SPAS prior to locking the satellite in the payload bay at 7:14 a.m.
A second extra day in space was granted to the five astronauts aboard Columbia when fog prevented a landing at Florida’s Kennedy Space Center and high winds on the Mojave Desert meant that Edwards Air Force Base also was not available. NASA’s final shuttle mission of 1996 concluded at 5:49 a.m. CST, December 7, with a landing at Kennedy Space Center. Jones goes after the Wake Shield for grappling after its 3-day flight. ORFEUS-SPAS II: The Orbiting and Retrievable Far and Extreme Ultraviolet Spectrograph-Shuttle Pallet Satellite IT (ORFEUS-SPAS II) mission was the third flight to use the German-built ASTRO-SPAS science satellite. The ASTRO-SPAS program is a cooperative endeavor between NASA and the German Space Agency, DARA. ORFEUS-SPAS II, a free-flying satellite, was deployed and retrieved using Columbia’ s Remote Manipulator System (RMS). The goal of this astrophysics mission was to investigate the rarely explored far- and extreme-ultraviolet regions of the electromagnetic spectrum, and study the very hot and very cold matter in the universe. ORFEUS-SPAS II attempted a large number of observing programs. Among the many areas in which scientists hoped to gain new insights during this mission was the evolution of stars, the structure of galaxies, and the nature of the interstellar medium, and others. Many of the objects they looked at had never before been observed in the far-ultraviolet. ASTRO-SPAS is a carrier designed for launch, deployment and retrieval by the space shuttle. Once deployed from the shuttle’s RMS, ASTRO-SPAS operated quasi-autonomously for 14 days in the vicinity of the shuttle. After completion of the free flight phase, the satellite was retrieved by the RMS, returned to the shuttle cargo bay and returned to Earth. The one-meter diameter ORFEUS telescope with the Far Ultraviolet (FUV) Spectrograph and the Extreme Ultraviolet (EUV) Spectrograph comprised the main payload. A secondary, but highly complementary, payload was the Interstellar Medium Absorption Profile Spectrograph (IMAPS). In addition to the astronomy payloads, ORFEUS-SPAS II carried the Surface Effects Sample Monitor (SESAM), the ATV Rendezvous Pre-Development Project (ARP), and the Student Experiment on ASTRO-SPAS (SEAS). The ORFEUS-SPAS II mission was dedicated to astronomical observations at very short wavelengths, specifically the two spectral ranges Far Ultraviolet and Extreme Ultraviolet. This part of the electromagnetic spectrum, which is obscured by the Earth’s atmosphere and not observed by the Hubble Space Telescope, includes a high density of spectral lines (especially from various states of hydrogen and oxygen), which are emitted or absorbed by matter covering a wide range of temperatures. The Interstellar Medium Absorption Profile Spectrograph (IMAPS) was a separate instrument, attached to the ASTRO-SPAS framework. IMAPS operated independently of the ORFEUS telescope. IMAPS operated for more than two days of free flight and during that time observed the brightest galactic objects at extremely high resolutions. This resolution allows study of fine structure in interstellar gas lines. The individual motions of interstellar gas clouds can be determined to an accuracy of 1.6 kilometers per second. Story Musgrave on Columbia’s flight deck, monitoring Wake Shield Facility trailing the orbiter. Another science payload was the Surface Effects Sample Monitor (SESAM), a passive carrier for state­ of-the-art optical surfaces and potential future detector materials. SESAM investigated the impact of the space environment on materials and surfaces in different phases of a space shuttle mission, from launch, orbit phase to re-entry into the Earth’s atmosphere. Among the SESAM samples were witness samples to the telescope mirror, allowing for accurate calibration measurements after landing. Sample spaces were available to scientific and industrial users. The ATV Rendezvous Pre­Development Project (ARP), part of the European Space Agency’s Automated Transfer Vehicle (ATV), was an element of the European manned space transportation program. Among the objectives of the ARP were to develop and validate ground simulation facilities; develop and demonstrate on-board control software and in­orbit relative GPS capabilities; and to demonstrate the operation of the optical rendezvous sensor in orbit. The Student Experiment on ASTRO-SPAS (SEAS) was an electrolysis experiment built by students of the German high school of Ottobrunn. It consisted of eight experiment chambers containing various metal salt solutions and two electrodes. Metal “trees” of different shapes were grown on one electrode. Photographs taken of this process during the mission were compared to those of identical experiments conducted on the ground under the full influence of Earth’s gravity. Columbia about to touch down at KSC on Dec. 7, 1996, after a record-breaking stay in space, the longest for any shuttle mission (nearly 18 days). DARA SCHOOL PROJECT: For this second ORFEUS-SPAS mission, DARA developed an innovative educational program designed to reach students in 170 German schools teaching astronomy, physics and computer science. The classes were tailored to prepare the students to use ORFEUS­ SPAS data in the study of general astronomy, the life and death of stars, stellar spectral analysis, as well as how to work with the data on computers via the Internet. DARA supplied the necessary written course information and developed an ORFEUS-SPAS Internet home page, where students received and worked directly with the data obtained during the mission. WAKE SHIELD FACILITY-3 (WSF-3): The WSF-3 was a 12-foot diameter, free-flying, stainless steel disk designed to generate an “ultra­ vacuum” environment in space in which to grow semiconductor thin films for use in advanced electronics. The STS-80 crew deployed and retrieved the WSF during the 17-day mission using Columbia’s “robot arm,” or Remote Manipulator System. Wake Shield was sponsored by the Space Processing Division in NASA’s Office of Life and Microgravity Sciences and Applications. It was designed, built and operated by the Space Vacuum Epitaxy Center at the University of Houston-a NASA Commercial Space Center, in conjunction with its industrial partner, Space Industries, Inc., also in Houston. Low-Earth Orbit (LEO) space has only a moderate natural vacuum, one that can be greatly improved through the generation of an “ultra vacuum” wake behind an object moving through orbit. The unique ultra vacuum produced in the wake of the WSF has been shown in past flights to be 100 to 1,000 times better than the best operating ground-based laboratory chamber vacuums. Using this ultra­vacuum in space, the WSF had already grown the highest purity aluminum gallium arsenide thin films, and holds the promise of producing the next generation of semiconductor materials along with the devices they make possible. The major objective of this third flight of WSF is to grow thin “epitaxial” films which could have a significant impact on the micro-electronics industry because the use of advanced semiconducting thin film materials in electronic components holds a very promising economic advantage. The commercial applications for high quality semiconductor devices are most critical in the consumer technology areas of personal communications systems, fiber optic communications, high-speed transistors and processors, and opto­electronic devices. The Space Experiment Module (SEM) was a NASA Goddard Space Flight Center Shuttle Small Payloads Project education initiative that provided increased educational access to space. The program targeted kindergarten through university level participants. SEM stimulated and encouraged direct student participation in the creation, development, and flight of zero-gravity and microgravity experiments on the space shuttle. SEM’s first flight included a number of experiments sponsored by the Charleston, SC, school district (CAN­DO). Their experiments included Gravity & Acceleration Readings, Bacteria-Agar Research Instrument, Crystal Research in Space, Magnetic Attraction Viewed in Space, and numerous passive items such as algae, bones, yeast, and photographic film. Purdue University in West Lafayette, IN, also sponsored a number of experiments: Fluid Thermal Convection, NADH Oxidase Absorbence in Shrimp, and a Passive Particle Detector experiment. Hampton Elementary School in Lutherville, MD, experimented with seeds, soil, chalk, crayon, calcite, Silly Putty, bubble solution, popcorn, mosquito eggs, and other organic compounds. Glenbrook North High School in Northbrook, IL, had a Surface Tension experiment. Albion Jr. High in Strongville, OH, flew a heat transfer experiment and studied the heating properties of copper tubes and pennies. Poquoson Middle School in Poquoson; VA, conducted a Bacteria Inoculation in Space experiment and NORSTAR (Norfolk Public Schools Science and Technology Advanced Research) in Norfolk, VA, observed the behavior of immiscible fluids. NIH-R4 was the fourth in a series of collaborative experiments developed by NASA and the National Institutes of Health. NASA’s Ames Research Center, Mountain View, CA, was the experiment developer. Principal investigator of the NIH­R4 experiment, “Calcium, Metabolism and Vascular Function After Space Flight,” was the Oregon Health Sciences University, Portland. For many years, they investigated the role of calcium in blood pressure regulation. Calcium has long been recognized as a critical mineral in the nor­ mal development and function of bone and muscle. These researchers were among the first to demonstrate that calcium also is essential for normal cardiovascular function. This study added to the body of knowledge necessary to maintain the health of astronauts during space flight. In addition, it added new and exciting data to a growing body of evidence that calcium is a mineral with myriad functions critical to the normal function of human life on Earth. Kent Rominger and Tammy Jernigan change lithium hydroxide canisters (for CO2 removal) on the orbiter middeck. NASA/CCM-A is one in a series of bone cell experiments conducted aboard the space shuttle. Results from a previous shuttle flight, NIH.C4 on STS-69, indicate that bone is affected by microgravity at the cellular level. The investigators participating in the STS-80 CCM-A mission hope to confirm their previous findings, and further test the hypothesis that the absence of gravity has a negative effect on bone formation. Weightlessness results in bone loss in astronauts, similar to what occurs in people who undergo prolonged bed rest or, in some cases, lose the use of one of their limbs due to injury or disease. The exact cause of the bone loss is not yet clear, but it is at least partially due to decreased activity of osteoblasts, the cells which produce the matrix which mineralizes to become bone. Weightlessness results in similar decreased bone formation in both rodents and humans. Results from this experiment help scientists determine the usefulness of cultured bone cells in understanding how the acceleration due to gravity functions to maintain bone cell activity. The Principal Investigator for this study was the Mayo Clinic, Rochester, MN. Osteoblast adhesion and phenotype in microgravity: Among the unanswered questions of bone loss during space flight are the direct effects that microgravity exerts on bone cells, and the mechanisms by which these cells recognize changes in gravity. This study focused on bone cells of the osteoblast family, which synthesize bone matrix and also may participate in its breakdown (resorption) by regulating the formation and activity of bone-resorbing cells, osteoblasts. The investigators of this study were the Departments of Orthopedics, and Ophthalmology at Mount Sinai School of Medicine, NY. The project was sponsored by NASA’s Office of Life and Microgravity Sciences and Applications Small Payloads Program, and the National Institute of Arthritis and Musculoskeletal Diseases. BIOLOGICAL RESEARCH IN CANISTER (BRIC): Although various effects of microgravity on plants have been observed, little is known about the underlying mechanisms involved. BRlC-09 studied the influence of microgravity on genetically altered tomato and tobacco seedlings that had been modified to contain elements of soybean genes. This study provided information about plants’ molecular biology and insight into the transport and distribution mechanisms for hormones within plants. The research provides crucial information on how to improve growth rates and biomass production of space-grown plants as well as information on how to enhance crop productivity on the Earth. The improvement of growth rate and biomass production of space­ grown plants is particularly useful for the development of life support systems to support crews over long­ duration flights. The improvement of growth and biomass production of space-grown plants also is an important step toward commercial application of space using plants as bioreactors for pharmaceutical products and for other commercial purposes. The principal investigator was, Kansas State University, Division of Biology, Manhattan, KS. Ken Cockrell and Tammy Jernigan award Story Musgrave his “Master of Space” patch for exceeding 1000 hours in space during 6 flights to orbit. The ceremony took place on Columbia’s middeck with the four sleep stations in the background. COMMERCIAL MDA ITA EXPERIMENT (CMIX-5): CMIX-5 was the last in a series of five shuttle flights linking NASA and the University of Alabama/Huntsville (UAH) Consortium for Materials Development in Space, with flight hardware privately developed by Instrumentation Technology Associates (ITA) of Exton, PA.
UAH research included diabetes treatment; cell reaction in microgravity that may lead to tissue replacement techniques; the development of gene combinations that are toxic to insect pests but not harmful to other species, thus creating a natural pesticide; and an environmental monitoring model using mysid shrimp. A key activity for ITA was the ongoing effort to grow large protein crystals of urokinase for research linked to breast cancer inhibitors. There was also an ITA materials analysis study to see if the use of sealants in microgravity can lead to better protection of ntional monuments against acid rain. ITA also sponsored seven elementary and high school research activities as well as experiments linked to the National Space Society and the International Space University. VISUALIZATION IN AN EXPERIMENTAL WATER CAPILLARY PUMPED LOOP (VIEW­CPL): This technology was an option for spacecraft thermal management. A CPL collects and transports excess heat generated by spacecraft instruments. The heat is transported to a spacecraft radiator for rejection into space. Requiring no mechanical pump, a CPL can transport more energy for longer distances than heat pipes currently used today. The purpose of the STS-80 experiment was to help develop a complete understanding of CPL physics in a microgravity environment by viewing the fluid flow inside the evaporator. VIEW-CPL was developed by the Department of Mechanical Engineering of the University of Maryland at College Park, as part of NASA’s In-Space Technology Experiment Program (IN­ STEP). The STS-80 crew on Columbia’s middeck: Cockrell, Jernigan, Rominger in back row; Jones and Musgrave up front. Commander: Kenneth D. Cockrell. Cockrell, 46, was born, in Austin, TX. He received a bachelor of science degree in mechanical engineering from the University of Texas and a master of science degree in aeronautical systems from the University of West Florida. Cockrell was selected as an astronaut by NASA in January 1990 and became qualified for a flight assignment July 1991. A veteran of three space flights, including STS-56 in 1993 and STS-69 in 1995, he has logged more than 906 hours in space. Pilot: Kent V. Rominger (CMDR, USN). Rominger, 40, was born in Del Norte, CO. He received a bachelor of science degree in civil engineering from Colorado State University and a master of science degree in aeronautical engineering from the U.S. Naval Postgraduate School. Rominger reported to the Johnson Space Center in August 1992 and after completing the one year of required training became qualified for future flight assignment. He made his first space flight from Oct. 20 to Nov. 5, 1995, on STS-73 during which Rominger served as pilot. With the completion of STS-80, Rominger has logged more than 806 hours in space. Ken Cockrell on Columbia‘s flight deck after landing. Mission Specialist: Tamara E. Jernigan (Ph.D.). Jernigan, 37, was born in Chattanooga, TN. She received a bachelor of science degree in physics (with honors) and a master of science degree in engineering science from Stanford University. Jernigan also earned a master of science degree in astronomy from the University of California-Berkeley and a doctorate in space physics and astronomy from Rice University. Jernigan was selected as an astronaut candidate by NASA in June 1985 and became an astronaut in July 1986. A veteran of four space flights, Jernigan was a mission specialist on STS-40 in 1991 and STS-52 in October 1992. She was the payload commander on STS- 67 in March 1995 and with the completion of STS-80 has logged more than 1,278 hours in space. Mission Specialist: Thomas D. Jones (Ph.D.). Jones, 41, was born in Baltimore, MD. He received a bachelor of science degree in basic sciences from the United States Air Force Academy in Colorado Springs, CO, and a doctorate in planetary science from the University of Arizona in Tucson. After a year of training following his selection by NASA in January 1990, Jones became an astronaut in July 1991. In 1994, he flew as a mission specialist on successive flights of Space Shuttle Endeavour and the Space Radar Laboratory payload. His first flight was in April 1994 on STS-59 and then in October 1994 on STS-68, he served as payload commander for Space Radar Lab 2. With the completion of STS-80, Jones has logged more than 963 hours in space. Mission Specialist: Story Musgrave (MD). Musgrave, 61, was born in Boston, MA, but considers Lexington, KY, to be his hometown. He received a bachelor of science degree in mathematics and statistics from Syracuse University, a master of business administration degree in operations analysis and computer programming from the University of California at Los Angeles, a bachelor of arts degree in chemistry from Marietta College, a doctorate in medicine from Columbia University, New York, NY, a master of science in physiology and biophysics from the University of Kentucky, and a master of arts in literature from the University of Houston. Musgrave was selected as a scientist-astronaut by NASA in August 1967. A veteran of six space flights, Musgrave was a mission specialist on STS-6 in 1983, STS-51 F in 1985, STS-33 in 1989 and STS-44 in 1991. He was the payload commander on STS-61 in 1993 and with the completion of STS-80 has logged more than 1,282 hours in space. His sixth flight tied him with John Young’s record for most number of space flights by any human being and, at age 61, made him the oldest person ever to fly in space. The STS-80 mission patch depicts Space Shuttle Columbia and the two research satellites its crew deployed into the blue field of space. The uppermost satellite is ORFEUS-SPAS (Orbiting Retrievable Far and Extreme Ultraviolet Spectrograph-Shuttle Pallet Satellite), a telescope aimed at unraveling the life cycles of stars and understanding the gases that drift between them. The lower satellite is the Wake Shield Facility, flying for the third time. It used the vacuum of space to create advanced semiconductors for the nation’s electronics industry. ORFEUS and Wake Shield are joined by the symbol of the Astronaut Corps, representing the human contribution to scientific progress in space. The two bright blue stars represent the mission’s space walks, final rehearsals for techniques and tools to be used in assembly of the International Space Station. Surrounding Columbia is a constellation of 16 stars, one for each day of the mission, representing the stellar talents of the ground and flight team that share the goal of expanding knowledge through a permanent human presence in space. I participated in the mission as a member of the Board of Directors of the National Space Society’s Education Chapter with regard to the CMIX-5 Student Shuttle Experiment. I developed the NSSEC Web Site where students could see the experiment details and participate in the experiment on the ground. I am glad to have had the opportunity to participate in an activity that sparked interest in the student population for space studies. Thanks, Kristen — Great to have had your excellent experiment package along for the ride. If you have any spare stickers from that CMIX, shoot me an email via the site. I’d love to get one. Glad we were able to fly together.